Investigation of single or mixed assemblages of native Estherella sp. and exotic Pontoscolex corethrurus from a rain forest in Puerto Rico was undertaken to understand resource use patterns, and linkages with C and N mineralization in a 19-day incubation. 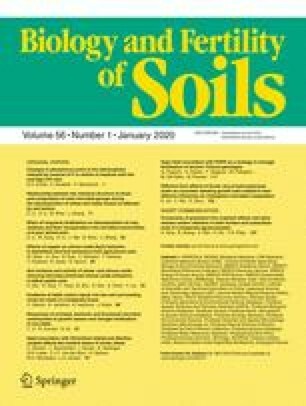 Resource use was explored with addition of 15N-enriched leaf litter and 13C-enriched glucose to reconstructed organic and mineral soil horizons. Juvenile Estherella sp. became at least 6.06‰ more enriched in 13C than sub-adult Estherella sp. or adult P. corethrurus. Sub-adult Estherella sp. became >3.6‰ enriched in 13C over P. corethrurus. δ15N acquired by P. corethrurus was greater by 0.83–1.56‰ in the mixed-species than the single-species assemblages. δ15N of sub-adult Estherella sp. was enriched by 0.73–0.81‰ over juvenile Estherella sp. in the single-species assemblage. Net N immobilization occurred in the organic layer of all 15N-enriched treatments. Net N mineralization in mineral soil layers was significantly greater in microcosms with P. corethrurus than in those containing only Estherella sp.. Cumulative respiration was greatest in P. corethrurus assemblages, however, assemblages with only Estherella sp. released more 13C in respiration. P. corethrurus assimilated different N resources when incubated with, as compared to without, native Estherella sp.. δ13C and δ15N signatures acquired by assimilation of 13C and 15N differed by species, developmental stage, and competitive interactions. The results showed that alone, exotic P. corethrurus induced higher mineralization rates than native Estherella sp., but that the interaction of exotic and native species impinged on resource use by P. corethrurus, reducing the effect of the exotic species on C and N mineralization. Invasion of exotic P. corethrurus may change the mineralization potentials of C and N and their biogeochemical cycling in soils.